There is a dramatic shortage of skilled cybersecurity professionals worldwide, with enterprises competing for new hires among a slowly expanding pool of resources. These positions are not only tough to fill, but the starting salaries for these jobs are $70,000 on average, according to recent Glassdoor estimates, with experienced, senior-level security analysts easily commanding six-figures. Given these conditions in the cybersecurity job market, unfilled cybersecurity jobs are expected to reach 1.5 million by 2019, according to IDG, even as cybersecurity spending exceeds $1 trillion by 2021 as enterprises race to lock up talent that is capable of responding to the latest and greatest security attacks. 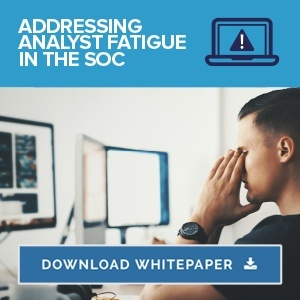 Because of this lack of talent, along with the high cost of hiring, many enterprise SOCs are unable to fully staff their operations, forcing already overworked analysts to do more with less. Yet even if more highly-skilled cybersecurity professionals were available, hiring enough analysts to respond to the high volume of security alerts that are received 24/7/365 would be cost prohibitive. This leads CISOs and SOC Managers to research security solutions that promise to automate their pain away. Unlike other competitors that over-emphasize automation, Syncurity’s IR Flow seamlessly incorporates human analysts in the loop to deliver consistent, repeatable security outcomes every time. IR Flow force multiplies security teams of all sizes and maturity levels, allowing even junior analysts to rapidly adapt to new use cases and continuously put their skills to their highest and best use, instead of focusing on repetitive, manual, low-level tasks. IR Flow allows analysts to automate previously manual security operations processes through customizable “Playbook Templates” for dozens of alert and incident types. IR Flow allows enterprises to quickly codify best practices, policies and procedures into custom playbooks for phishing, malware or ransomware attacks.